Rembrandt van Rijn, The Night Watch or The Militia Company of Captain Frans Banning Cocq, 1642, oil on canvas, 363 cm × 437 cm (143 in × 172 in), Rijksmuseum, Amsterdam. The painting is a classic example of Baroque art. The prosperity of 17th century Holland led to an enormous production of art by large numbers of painters who were mostly highly specialized and painted only genre scenes, landscapes, still lifes, portraits or history paintings. Technical standards were very high, and Dutch Golden Age painting established a new repertoire of subjects that was very influential until the arrival of Modernism. The Council of Trent (1545–63), in which the Roman Catholic Church answered many questions of internal reform raised by both Protestants and by those who had remained inside the Catholic Church, addressed the representational arts in a short and somewhat oblique passage in its decrees. This was subsequently interpreted and expounded by a number of clerical authors like Molanus, who demanded that paintings and sculptures in church contexts should depict their subjects clearly and powerfully, and with decorum, without the stylistic airs of Mannerism. This return toward a populist conception of the function of ecclesiastical art is seen by many art historians as driving the innovations of Caravaggio and the Carracci brothers, all of whom were working (and competing for commissions) in Rome around 1600, although unlike the Carracci, Caravaggio persistently was criticised for lack of decorum in his work. However, although religious painting, history painting, allegories, and portraits were still considered the most noble subjects, landscape, still life, and genre scenes were also becoming more common in Catholic countries, and were the main genres in Protestant ones. The term "Baroque" was initially used with a derogatory meaning, to underline the excesses of its emphasis. Others derive it from the mnemonic term "Baroco" denoting, in logical Scholastica, a supposedly laboured form of syllogism. In particular, the term was used to describe its eccentric redundancy and noisy abundance of details, which sharply contrasted the clear and sober rationality of the Renaissance. It was first rehabilitated by the Swiss-born art historian, Heinrich Wölfflin (1864–1945) in his Renaissance und Barock (1888); Wölfflin identified the Baroque as "movement imported into mass", an art antithetic to Renaissance art. He did not make the distinctions between Mannerism and Baroque that modern writers do, and he ignored the later phase, the academic Baroque that lasted into the 18th century. Writers in French and English did not begin to treat Baroque as a respectable study until Wölfflin's influence had made German scholarship pre-eminent. Led by Italy, Mediterranean countries, slowly followed by most of the Holy Roman Empire in Germany and Central Europe, generally adopted a full-blooded Baroque approach. A rather different art developed out of northern realist traditions in 17th century Dutch Golden Age painting, which had very little religious art, and little history painting, instead playing a crucial part in developing secular genres such as still life, genre paintings of everyday scenes, and landscape painting. While the Baroque nature of Rembrandt's art is clear, the label is less use for Vermeer and many other Dutch artists. Most Dutch art lacks the idealization and love of splendour typical of much Baroque work, including the neighbouring Flemish Baroque painting which shared a part in Dutch trends, while also continuing to produce the traditional categories in a more clearly Baroque style. In France a dignified and graceful classicism gave a distinctive flavour to Baroque painting, where the later 17th century is also regarded as a golden age for painting. 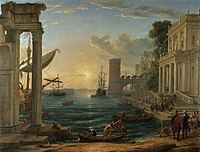 Two of the most important artists, Nicolas Poussin and Claude Lorrain, remained based in Rome, where their work, almost all in easel paintings, was much appreciated by Italian as well as French patrons. Jan Brueghel the Elder, The Entry of the Animals Into Noah's Ark, 1613. ^ Counter Reformation Archived 2008-12-11 at the Wayback Machine, from The Columbia Encyclopedia, Sixth Edition. 2001–05. ^ "Getty profile, including variant spellings of the artist's name". Getty.edu. 2002-12-11. Retrieved 2012-02-13. ^ Panofsky, Erwin (1995). "What is Baroque?". Three Essays on Style. The MIT Press: 19. Belting, Hans (1994). Likeness and Presence: A History of the Image before the Era of Art. Edmund Jephcott. University of Chicago Press. ISBN 0-226-04215-4.